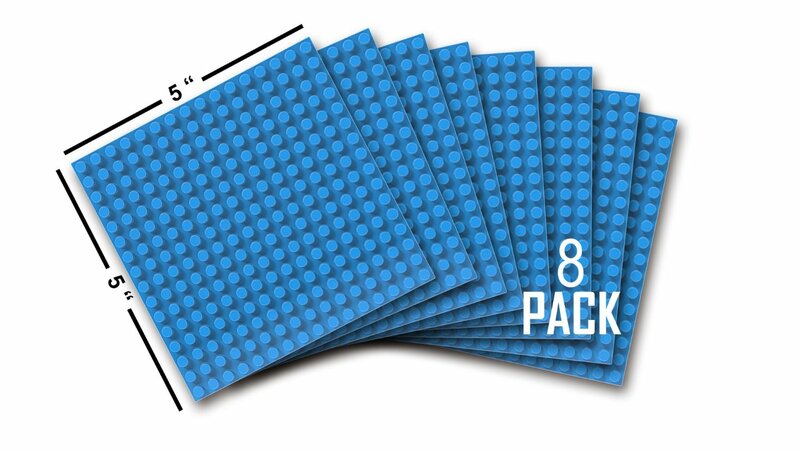 Don't run out of baseplates again with this 8 pack 5x5 inch Blue plates. Compatible with all major building bricks company's. Ideal for group building with family and friends. 8 pack 5x5 inch Blue baseplates compatible with Lego and other major building block manufacturers. keeps your creations together and easy to carry and display .Guaranteed tight fit. Don't run out of plates again with this 8 pack. Great for group building. Recommended for age 3 and up. Not for DUPLO sized blocks. These are great to have on hand for any lego enthusiasts. I love to use these to build out a stage for lego stop animation videos. These are small but when put together can make a great ocean of blue plates which is perfect for ocean scenes. These are made well and thick but not thicker than the ones directly from lego but not thin to the point you could easily snap them. I haven't found any issues with compatibility with lego and these plates.